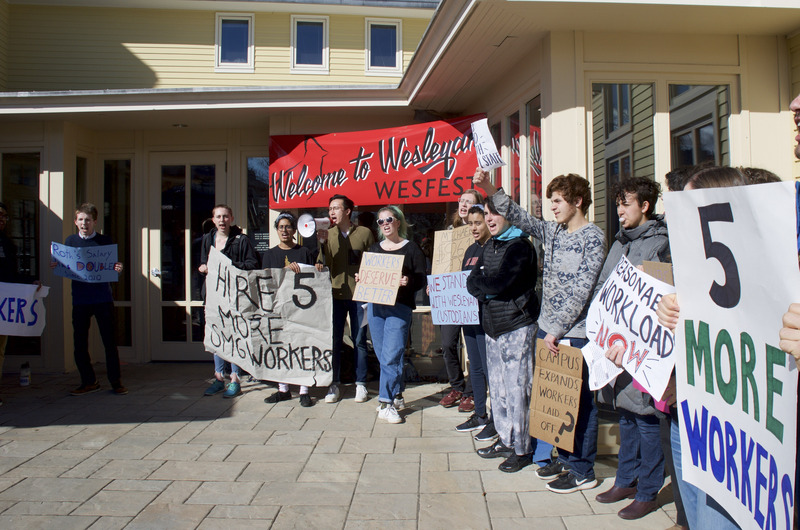 Standing in solidarity with custodial staff and demonstrators, the Wesleyan Student Assembly (WSA) passed a resolution, 22-0 with 6 abstentions, that called for the administration to immediately begin working toward hiring at least five more janitorial workers. The WSA voted to overturn the bylaws that require a one-week waiting period between the presentation of a resolution and the voting period due to its time-sensitive nature. The resolution comes in light of recent protests that occurred over WesFest and were the latest step in an ongoing effort by Wesleyan United Student Labor/Action Coalition (USLAC) to address unreasonable custodial workloads. The sponsors of the resolution believed it was important to take a stance on this issue as representatives of the student body. USLAC member and one of the organizers of last week’s protests Emma Llano ’19 expressed her gratitude that the WSA is standing in solidarity with the janitorial workers and USLAC’s demands. The resolution also commented on what transpired at the protests themselves, not only supporting students’ decision to protest, but addressing the police being called on demonstrators. In the WSA General Assembly discussion of the resolution on April 14, the sponsors emphasized that since students only violated Community Standards Board (CSB) guidelines, not the law, they object to the police being called on protestors. “[This resolution is in] objection to the fact that the Middletown Police were called on student demonstrators during WesFest, despite the fact that their actions making them liable to disciplinary action were within the jurisdiction of the Community Standards Board,” the resolution read. Part of the resolution reiterated some of the grievances presented by protestors, such as the decreasing of the janitorial staff as the student population has increased. Like the protestors, the resolution argued that this increase in workloads creates dangerous and strenuous working conditions. Now that the resolution has passed, the sponsors will bring it to members of the administration, who must issue a formal response to it within a week, as is standard for WSA resolutions.